Patrick Topping, Kerri Chandler, Catz ‘N Dogz, Alan Fitzpartick and more. 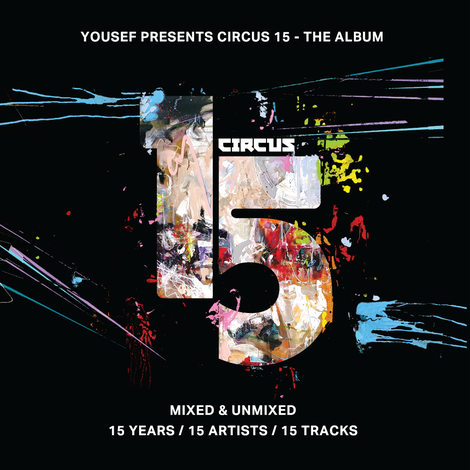 The list goes on as Yousef’s Circus reaches a historic milestone with his label, Circus Recordings, bringing together a selection of artists for a 15-track compilation album. A year in the making, each artist has been handpicked by Yousef himself and the album will celebrate each artist’s own long-standing relationship with Circus – everyone involved has performed at Circus a vast number of times since its inception in 2002. The album itself will take listeners and clubbers on a journey to the depths of house and techno; from Jamie Jones’ ‘Melodic Phase’ to Alan Fitzpatrick’s ‘Bhuna’; from Steve Lawler’s ‘Classifried’ to Bontan’s high-octane, 303 fuelled ‘You Don’t Know’. Given the scale of the release, the album serves as a reminder of how Circus is an influential clubbing brand. It has booked these names but Yousef and his Circus team have played a pivotal role in springboarding the talent on display to the possible highest echelons of dance music fame many of them now experience. The likes of Carl Cox, Hot Since 82 and Joris Voorn all inject a high dosage of Balearic energy before Yousef, the boss himself, will provide a mix of the entire album to give clubbers a real taste of the kind of damage such a release may be able to inflict on any party. Today, Circus aims to provide a platform for the hottest up and coming international and homegrown talent, as well as a hub for the mainstays of electronic music. Whether it’s through Circus the club night whose upcoming 15th birthday party will see the likes of Carl Cox, Peggy Gou, Kolsch and many more play, or Circus Recordings the label whose releases may find themselves in the sets of the world’s leading tastemakers, Circus has proven itself to be a key component of electronic music over the past 15 years.